A loan modification is exactly what it sounds like, with your lender agreeing to change the terms of your loan agreement. By doing so, the borrower is able to more easily afford his or her payments in the future, meaning that the lender does not have to take action, such as starting the foreclosure process. 2. What are the benefits of a loan modification? There are many benefits of a loan modification, including but not limited to: a lower monthly payment, ability to prevent defaulting on your loan, interest rate reduction, and extended payment terms. There are also benefits to the lender, such as the capacity to continue to receive monthly payments, as opposed to going after you for non-payment. 3. How does a loan modification work? The loan modification process begins when the borrower contacts the lender to discuss his or her options. If you stop making payments and neglect to consider your options, such as a loan modification, the bank has the right to repossess the property, send your account to collections, or simply accept the loss. Formal discussions allow the lender and borrower to agree on new terms and conditions that better suit the borrower, thus enabling them to catch up on missed payments and stay current in the future. 4. What is a HAMP loan modification? A HAMP loan modification, also known as the Home Affordable Modification Program, is unique in the way that your mortgage lender implements a three-month trial period during which you have the opportunity to demonstrate your ability to make your new monthly payment on time. If you prove that you’re able to do so, your mortgage company will then extend your trial period through an official modification agreement. 5. How can I modify my mortgage loan? Modifying your mortgage loan is easier said than done. This isn’t something you can do on your own. Getting started means asking your lender for more information. Explain to your mortgage company why you are unable to make your mortgage payment, such as a job loss or serious medical emergency. This is a time to be open and honest, not a time to hide anything. Once you ask what options are available to you, you can discuss how to best move forward. Every bank has a different process for approving mortgage modifications, so the only way to know if you qualify is to speak with your lender. 6. How do I obtain a loan modification? Although the process to get a loan modification differs from one bank to the next, there are some basic steps you can take: review your situation, collect documentation that supports your financial crisis, contact your lender, share information on your condition, complete the necessary paperwork, and wait for a final determination. 7. Why do banks offer loan modification to borrowers? A loan modification does not only benefit the borrower. There are also benefits to the lender. The main advantage for lenders is the ability to continue to work with the borrower, as opposed to moving forward with the foreclosure process (in the event of a mortgage). Lenders are in the business of servicing loans, not owning real estate. They make more money by keeping you on board as a customer. 8. 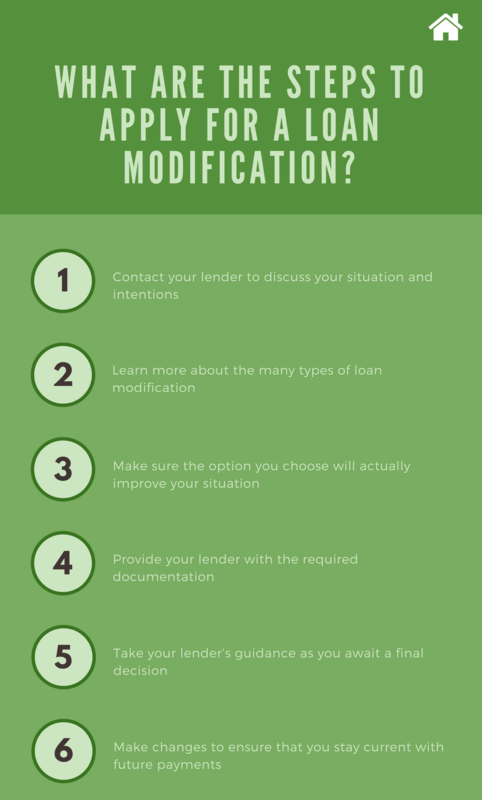 What are the many types of loan modification? There is more than one type of loan modification, so you should discuss each one with your lender. The most common options include: delay payments, interest rate reduction, principal reduction, longer term, and refinance the loan. 9. How long does it take to obtain a loan modification? This is mostly based on your lender, but you should expect to spend numerous hours requesting a change and speaking with your lender about what to do next. As you present your case, you will also be required to provide supporting documents. Once you submit all the necessary paperwork, it can take several weeks or months for your bank to make a final decision. During this waiting period, stay in touch with your lender so you know exactly what you should and should not be doing. 10. Who are the mortgage modification helpers? There are companies that specialize in helping people request a loan modification. These mortgage modification helpers claim to improve your chance of success, but this is not always true. Not only do you have to pay for their service, but there is no guarantee of success. You don’t need anyone to show you the way. As long as you work in close collaboration with the bank, you can move through the process in a timely manner. 11. 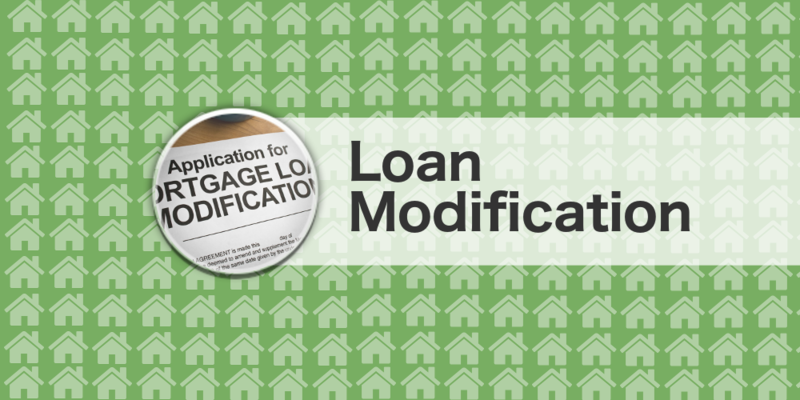 What are the steps to apply for a loan modification? 12. What is the difference between a loan modification, repayment plan, and forbearance agreement? A loan modification, repayment plan, and forbearance agreement can all help you avoid foreclosure and improve your financial situation. Loan modification: this is a permanent restructuring of your loan in which one or more details of the loan is adjusted to provide you with a more affordable payment. Repayment plan: if you have missed payments in the past as the result of a hardship, such as a job loss, a repayment plan can help. With this, your lender can spread the past due amount over the course of several months or tack this onto the end of your term. Forbearance agreement: a forbearance agreement is a short-term solution, with the bank agreeing to suspend or reduce your payment for a period of time, such as six months. As a borrower, you agree to resume making payments after the period ends, while also getting current in the future.